What? Thanksgiving in nearly one week?! It seems like it was just yesterday, I was being forced to run on treadmills to avoid temperatures that were 3 digits long. With that out there, it is time to start planning for the quickly approaching holiday season. While it is such a wonderful time to indulge in some of the seasonal foods and flavors, the season has the reputation of kicking some of our healthy habits to the wayside (say hello to food comas). However, there are still ways to accomplish balance while preparing for the “heaviness” of the holiday season. For example, those ate Meteor may choose to indulge in desserts without any recipe modifications to me made. Considering Thanksgiving is typically a multi course event, it may then be wise to lighten up some of the other dishes. By switching out ingredients that add fat and sugar into recipes, we can reduce the overall caloric content, boost some of the natural flavors, and fuel our bodies with better nutrition. 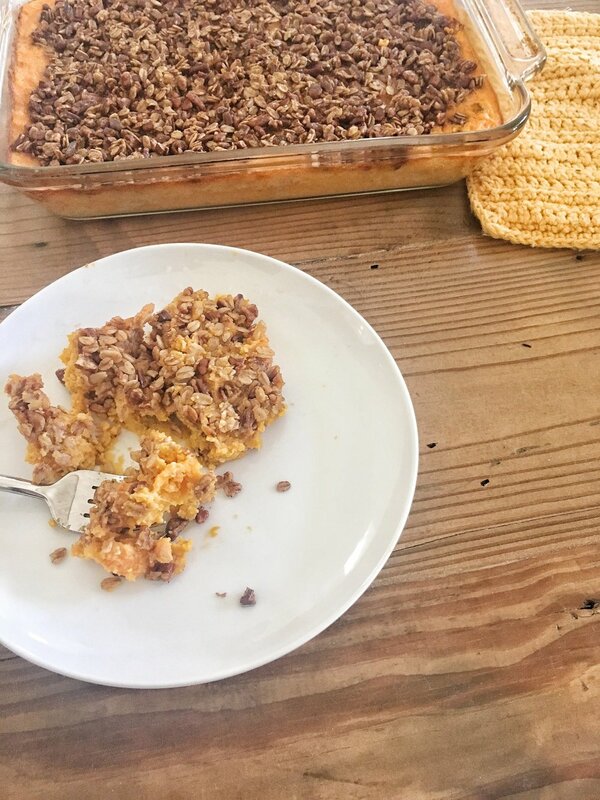 This sweet potato casserole is just one example of how to satisfy the taste buds of those around your dining room, yet keep their health in the forefront. Enjoy and remember to give your body the fuel to do the activities you love the most. Keep in mind, substitutions can be made for ingredients such as coconut milk, Earth Balance, eggs, and oats.